If the Static drivers shown above were configured by MHC as shown in the picture below, then the character 'a' will be transmitted on USART4 and 'b' will be transmitted on USART2. Harmony Static Drivers are simpler to use than Dynamic Drivers because they don't rely on an object-oriented (data structure-oriented) programming model. Data structures (objects) defining the drivers are not needed for the Static Drivers because the static driver functions are generated (customized) by MHC, based on the selections you've made in MHC. The Static Driver functions shown above are for USART Driver instance 0. The "0" in USART0" indicates which driver instance is being controlled. In other words, if you need two Static Drivers, MHC will generate a group of "USART0" functions and a group of "USART1" functions (to control driver instance 0 and instance 1 respectively). Once you have used MHC to generate the USART Static Drivers, you can use them as shown in the example below. You do not need to understand how MHC creates static drivers to use them. If you want these details, click the following button. 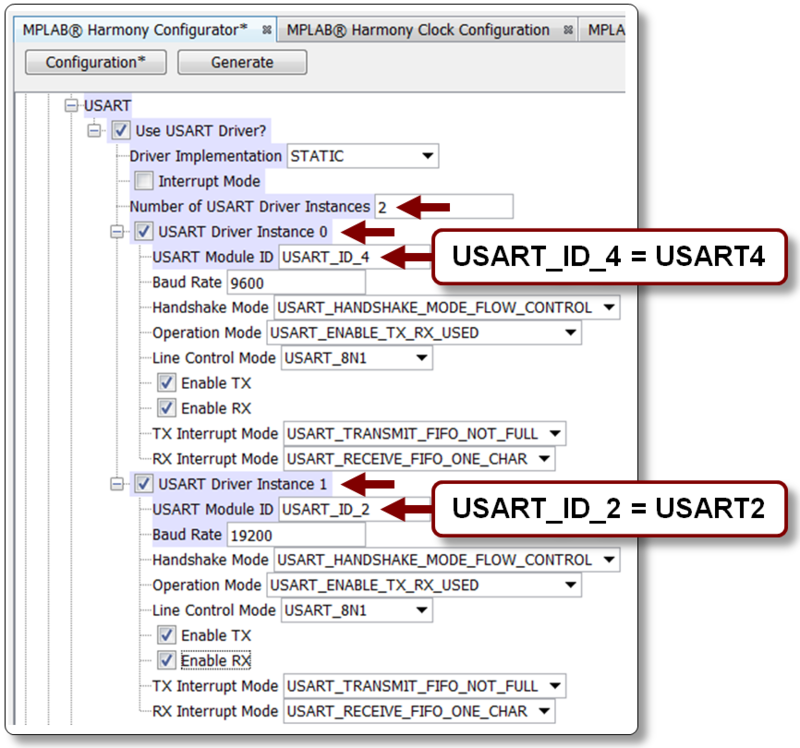 For a higher level understanding of how to use USART Static Drivers, click on the "Harmony USART Tutorial" button below.